Donkey Kong’s just wanted to be liked for so long. The erstwhile villain to everyone’s favorite plumber, Donkey Kong decided long ago that if you can’t beat him, you might as well join him — or, emulate him, in the case of Donkey Kong Country. The series has always played second fiddle to Super Mario Bros. — good in their own right, yet still lacking the charm and distinction of it’s far more innovative progenitor. Donkey Kong Country: Tropical Freeze does nothing to buck this trend. In fact, it feels almost entirely derivative of its predecessor, Donkey Kong Country Returns. In Tropical Freeze, Donkey Kong and his relatives have gathered to nosh on some bananas (surprise), when their idyllic island paradise is beset by chilly villains known as Snowmads. These icy marauders provide the necessary MacGuffin to whisk you and your fellow simians off on yet another challenging platforming adventure. Like Donkey Kong Country Returns, you’ll guide your apes through a series of increasingly difficult levels as you make your way to the fortress of the Snowmads’ leader. Baddies are dispatched by hopping on their heads or rolling into them with all the weight of a 500-pound gorilla. Bananas, coins, hidden collectables and pathways abound, and it’ll take all of your timing, patience, and ability to find them all. I’ll be repeating the phrase “like Donkey Kong Returns” a lot because Tropical Freeze is similar in almost every single respect. Like Donkey Kong Returns, you’ll swing from vine to vine, swim through deep oceans, ride mine carts and rocket barrels, collect puzzle pieces and KONG letters — stuff that’s been the hallmark of every Donkey Kong Country game since the 1990s. Controls are also similarly frustrating, as the Kongs move with the grace of, well, giant apes. Moving feels imprecise, with every action carried by a weird, greasy momentum. To make matters worse, rolling and pounding the ground are both mapped to the same button — leading to dozens of frustrating deaths. It made sense when the Wii version required use of the remote, but the Gamepad uses multiple buttons to perform the same action, with no real reason as to why. In fact, Tropical Freeze makes poor use of the Wii U’s most important features — the biggest infraction being its complete lack of any information displayed on the Gamepad’s screen. Other than using it as a way to play the game with the TV off, the Gamepad adds nothing to the experience — literally. When you’re playing Tropical Freeze on the television, you won’t get list of your current inventory items, or collected items, or even a map — the only thing that greets you is a blank screen. Nintendo’s having a hard time legitimizing the existence of the Wii U’s Gamepad, and Tropical Freeze is doing them no favors. Whether you use a Gamepad, Wii Remote, or Pro Controller, you’ll die — a lot. The Donkey Kong Country series is known for its steep difficulty, and Tropical Freeze is no different. You’ll have plenty of lives to burn through as long as you keep collecting bananas and coins, but it’s common to use a dozen or two just to pass one of more challenging levels near the end of the game. It becomes less about enjoying the moment-to-moment bits of gameplay, and rather about purely rote pattern memorization. Nowhere is this more evident than Tropical Freeze’s boss battles, easily the most hair-pullingly, controller-chuckingly frustrating moments in the entire game. They each start off fine, and many of them are interesting and offer up unique challenges, even if they rely on anticipating a specific set of moves over and over. But they drag on for way too long, many of these battles going on for five minutes or more — and a few false moves will put you right back at the start. Few things are more aggravating than getting so close to finishing off the boss, then having some stupid mistake force you to go through the same motions time and time again. 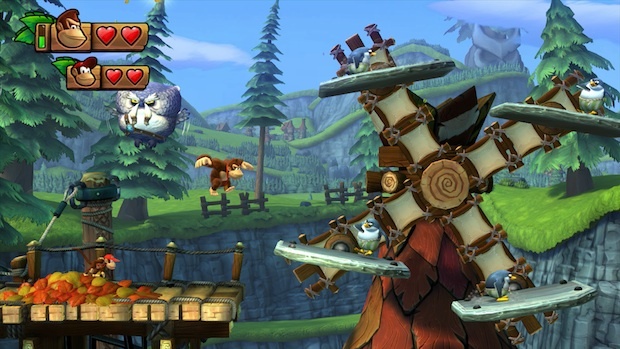 While the majority of Tropical Freeze feels so incredibly similar to Donkey Kong Country Returns, the inclusion of Dixie and Cranky Kong add some much needed variety to the proceedings. While you’ll have Diddy available to help you hover across long gaps with his coconut jetpack, Dixie Kong provides a slight helicopter lift as she jumps. And fans of Scrooge McDuck’s famous pogo-cane jump will find a lot to like with Cranky Kong, as adept players can use his cane to hop across perilous terrain. The addition of these characters changes things up, but only just — and those feelings of déjà vu will still linger despite their inclusion. And while the overall game feels incredibly similar to Donkey Kong Country Returns, at least Tropical Freeze looks great in high-definition. Yes, there are still those neat-looking silhouette levels, Donkey Kong’s trademark red tie the only color standing out amidst a sea of shadows — but now, those levels pop even more, looking better than they’ve ever been. Perspectives constantly shift as the Kongs explode out of barrel after barrel, and colors and environments look more vibrant and alive than ever — even if they look a little too much like the last game. Donkey Kong Country: Tropical Freeze is a solid, if at times frustrating platformer, but the inclusion of a couple new characters aren’t enough to stave off the feeling that we’ve seen all this before.